Things have moved on considerably from when I first got OpenWrt up on an RB450G. For one thing it no longer needs patches to the source or any special confg - the standard build will work. A lot of further useful information is available on the OpenWrt Hardware RG450G page. This is a second look at OpenWrt on the RB450G (for AAISP with IPv6) using the standard build of Attitude Adjustment (12.09), with a few optional enhancements of my own. In order to get it installed a minimal build is still needed, but otherwise its much easier this time round. In order to install OpenWrt we will need a network bootable image that runs from a RAM disk in order to be able to install the NAND Flash versions. For this we will need to build a minimal image from source. First up get the source on a machine suitable for building it. I used an Ubuntu 12.04 (Precise) 64-bit VM for this to avoid polluting other machines with cruft. I have created a minimal OpenWrt Network boot image configuration for the RB450G which can be renamed to .config in the source directory. More complex builds are possible if you want to do a more customized image. 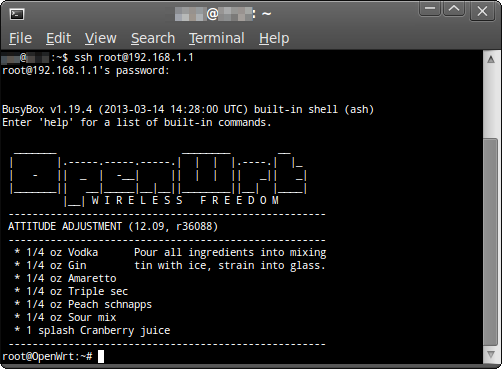 For more details see the OpenWrt Buid Instructions. The RB450G bootloader doesn't support full DHCP, only BOOTP. 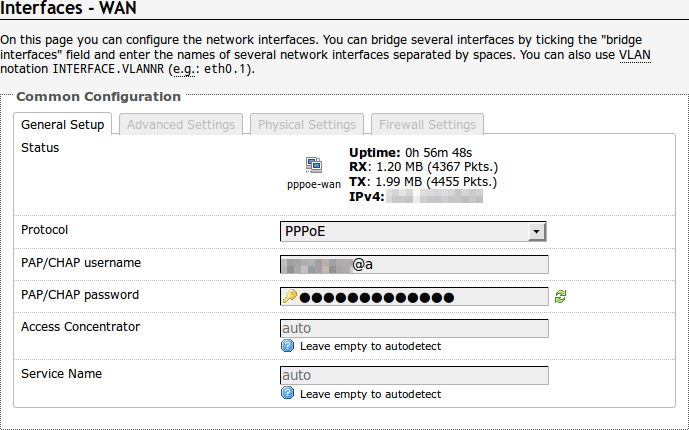 In my case I am leveraging my existing DHCP server (on Debian) so pretty nearly the same config as last time round. Restart dhcpd and we are ready to move on. The image needs to be delivered via TFTP and to do this I installed the tftpd-hpa package on my build VM. Then copy the image (above) to /var/lib/tftpboot/ which is the root of the TFTP server. We should now be ready to install. 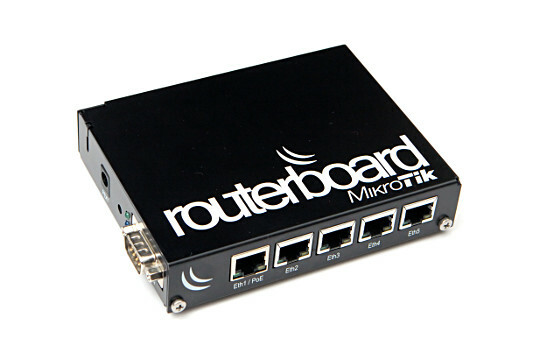 The RB450G has a Serial (RS232) connector on the side and with a Null Modem cable and/or a USB-serial adaptor at 115.2K 8N1 access to the console and bootloader is easy. In my case I chose 1 for a one-off boot from the network, then back to NAND Flash booting after that. Then x to exit the menus and boot. Once it finishes booting press enter to get shell. The image will boot with the LAN (switch) ports on 192.168.1.1/24 addressing. You will need to reconfigure your networking (potentially changing connections between ports) to ensure you have connectivity to the source webserver to install from. This can be the OpenWrt Image Downloads or you can place openwrt-ar71xx-nand-rootfs.tar.gz and openwrt-ar71xx-nand-vmlinux-lzma.elf on your own local webserver and install from there. The standard builds include LuCI, the web based configuration manager which can be accessed by putting the IP into your browser, else you can update config from the shell. Again, this can be done either via LuCI (System->Software) or with opkg from the shell. At this point you can go ahead and configure the network. The exact configuration will depend on what you want to achieve. In my case I'm using a routed (no-NAT) setup. At this point you should have a working network and can moving data through the router. There is no authentication on the serial port with OpenWrt. This means that anyone who can connect a cable to the router has immediate full root access. While there are limits to security when physical access is involved, it should definitely be possible to do better than this. This will simply disable the serial port shell. Note that this will also make recovery more difficult if something breaks ssh access. My script is way to complex to share - if you are doing stuff like that then no doubt you will already be intimately familiar with iptables/ip6tables, IP networking and not need an example to work from. For most people I'm guessing LuCI is probably the way to go, but the option is there if you require something more heavy duty. If as I do you tend to do most of your admin from the shell then a fully featured editor is a must. In my case I used "vim" which is available in OpenWrt. Install vim-full which will in turn also install libncurses and terminfo. If you want syntax highlighting then also add vim-runtime.